Well friends, last week I promised you a supremely cute book. 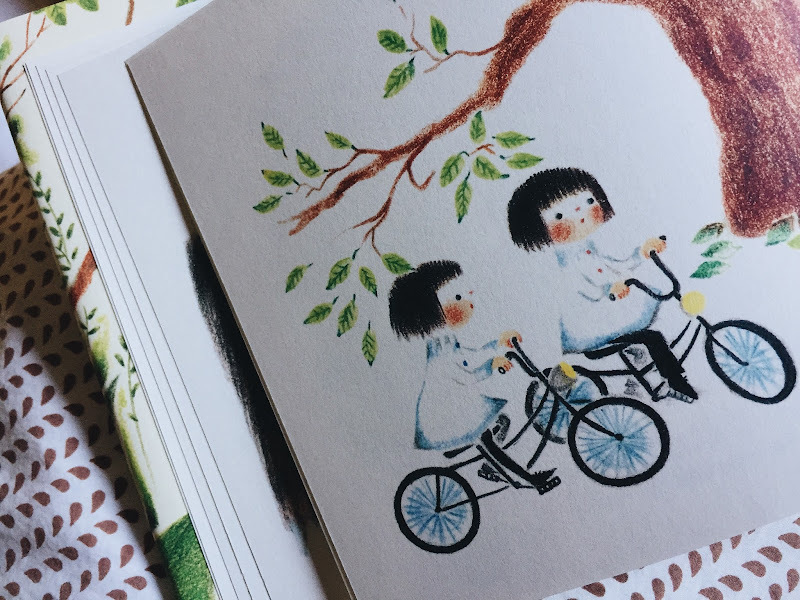 Maybe I said 'cutest book in the world'?? It was definitely something along those lines. 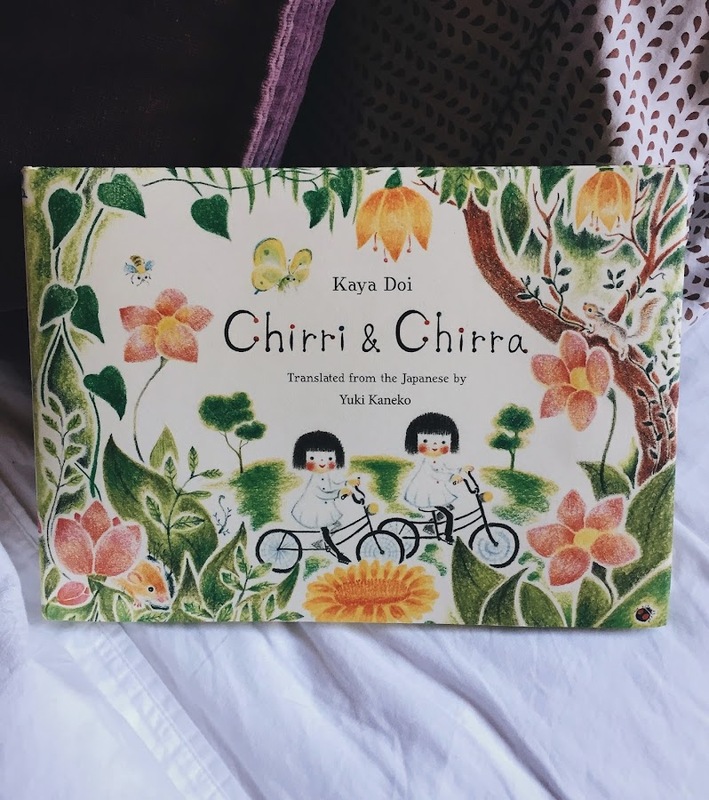 And please argue with me down in the comments if you think I'm wrong, but I think I super delivered on that promise and THEN SOME, because I'm pretty sure that 'Chirri & Chirra' by Kaya Doi (and translated from Japanese by Yuki Kaneko) is not only the most adorable book in the world, but let's make a bolder statement, shall we? THE CUTEST BOOK IN THE UNIVERSE. I saw this in a local bookstore a few weeks ago....I was moseying along, minding my own business. And when I saw this book on display, oh how I gasped. You all know I'm a huge gasper, right? Is gasper a word? Anyway, it's really embarrassing how much I gasp, at least it is to my child. Look at the picture immediately below these words. Look. THOSE ARE THE END PAPERS. Ok so where to start. First of all, this is the first in a planned series. Oh my word, there are going to be more!!! 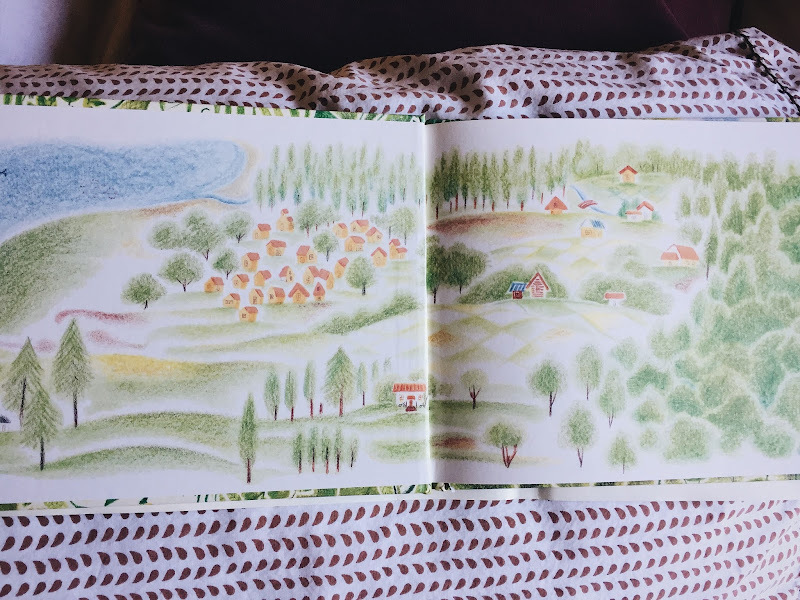 The story follows two little girls who wander through the countryside and a forest. It's very simple, very charming, very sweet, and SO CUTE YOU CAN'T BELIEVE IT. The first stop along the way for the kiddos is a tiny forest cafe. I just about fainted when I saw this. 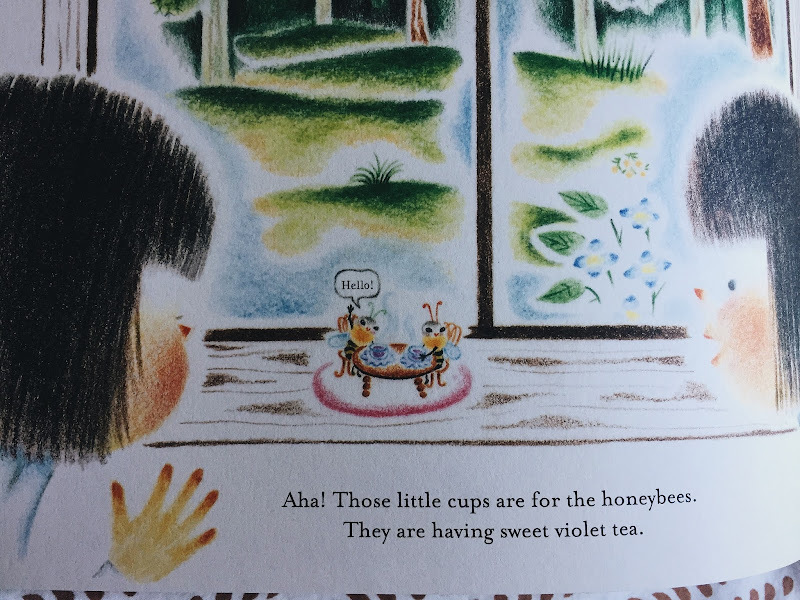 Tiny honeybees are drinking Sweet Violet Tea!!!! I have to take this pause to tell you that I am now straight up obsessed with the artwork of Kaya Doi. And.....MORE GASPING.....there's going to be a new book in spring 2017! 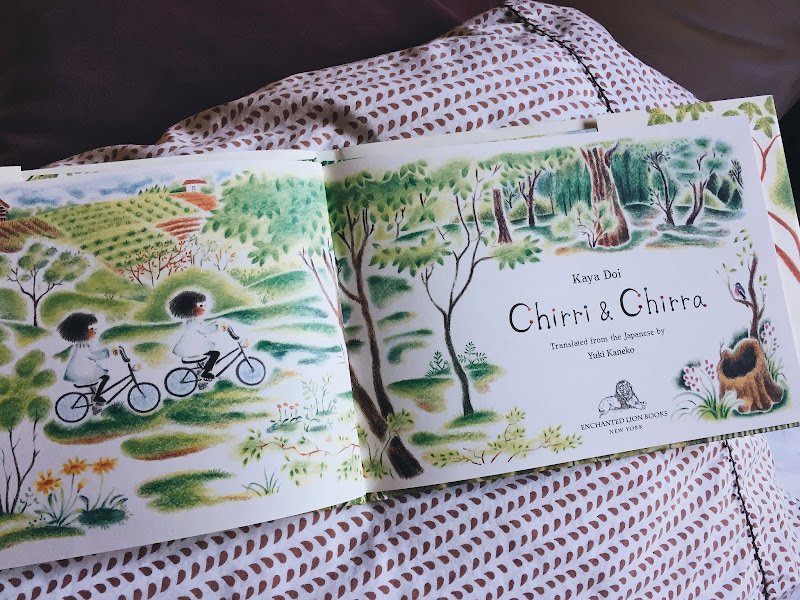 'Chirri & Chirra, The Springtime Meadow'. Why yes. I will be buying this. 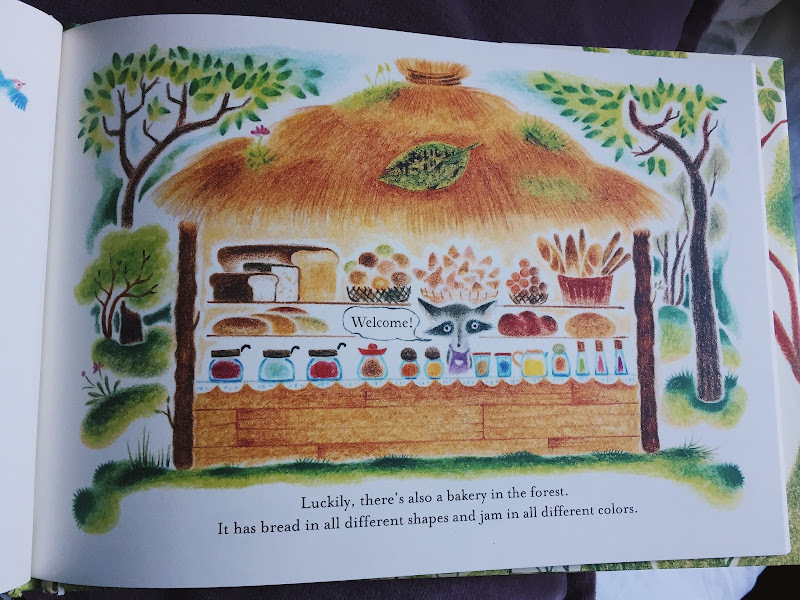 The girls also find a bakery in the middle of the forest -- look at the treats described! Carrot buns with lemon jam. Mulberry jam on honey bread! 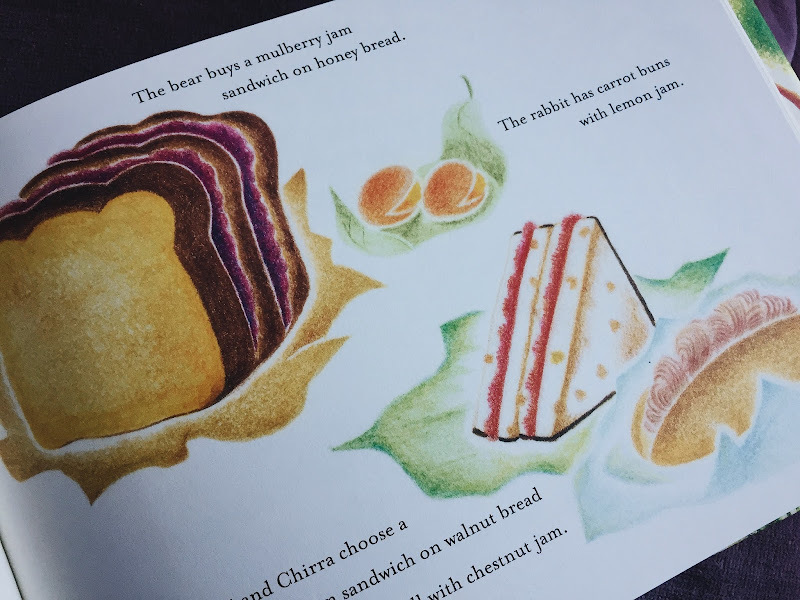 Strawberry jam sandwiches! They ride their bikes. They have a picnic at a pond. They take a nap. Seriously. A bakery in the forest?? More fainting from me happened at this point. Next they find a little hotel! Oh excuse me....a FOREST hotel! 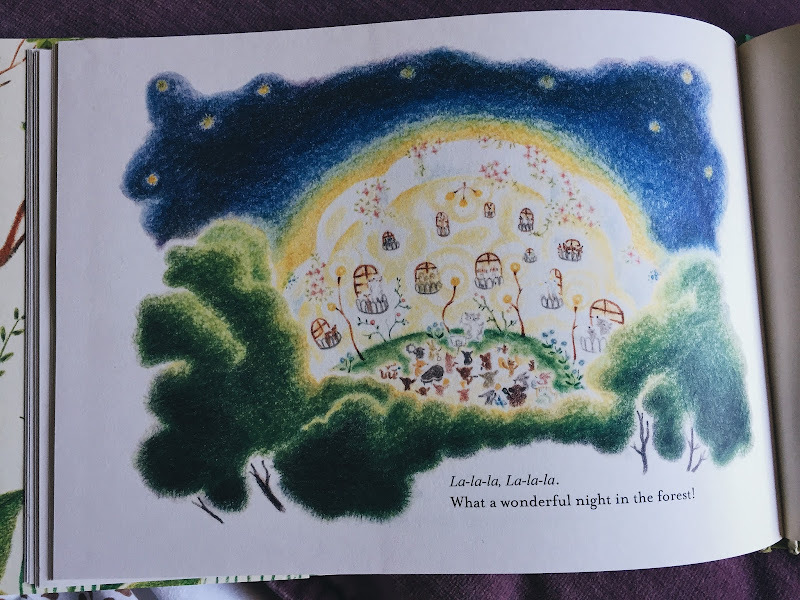 After getting all settled and snuggled down in their hotel room, the children are told that there will be a concert in the forest that evening. BECAUSE IT'S THAT KIND OF FOREST. The kiddos, and other various and assorted animals all join and sing along with the music. You guys, it was really hard for me to refrain from photographing the entire book. Oh and I think I have to get 'At Rainha's Garden', which is about changing seasons, even though it's all in Japanese, which I don't speak. But I do speak beautiful art appreciation and well, just look at that cover! Doi's art utilizes colored pencils, pastels, and crayons - and the slightly smudged, hazy effect totally lends to the dreamlike feel of the illustrations. 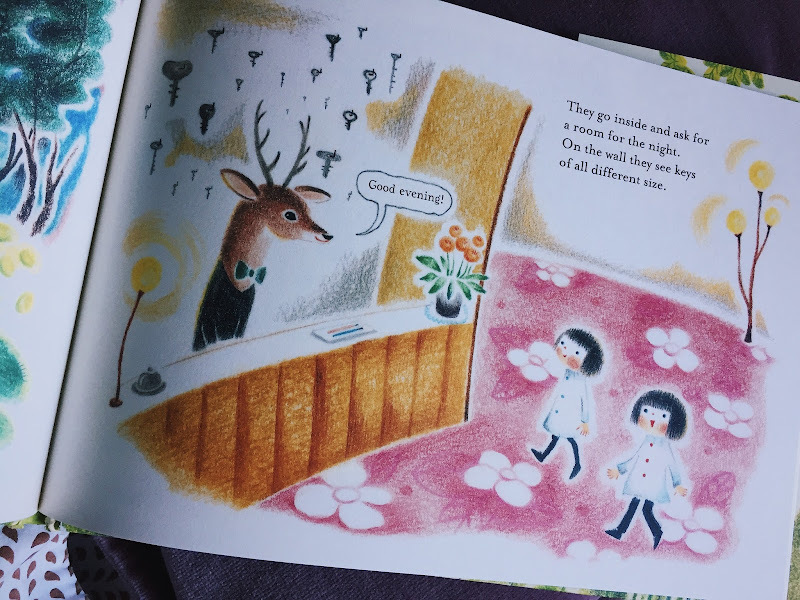 Her work is very well known in Japan, and I'm hoping hoping hoping that more of it shows up in English bookstores! This is a perfect book. Go. Buy one for every tiny tot you know. Spread some beauty. isn't it? It makes me happy every time i walk past it. 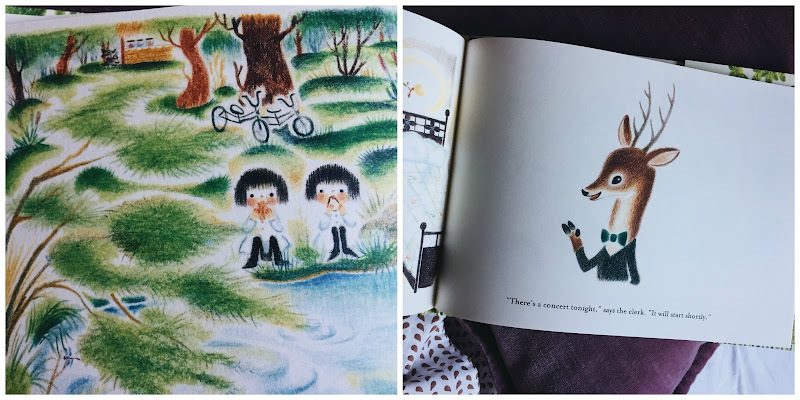 I thought the same thing about the old Golden Books - I wish I could remember the name of the illustrator I am thinking of! yes yes! I can see how Mary Blair would pop up as a memory reference! SO CUTE. Must find this one! Those honeybees! And forests! Eeek! 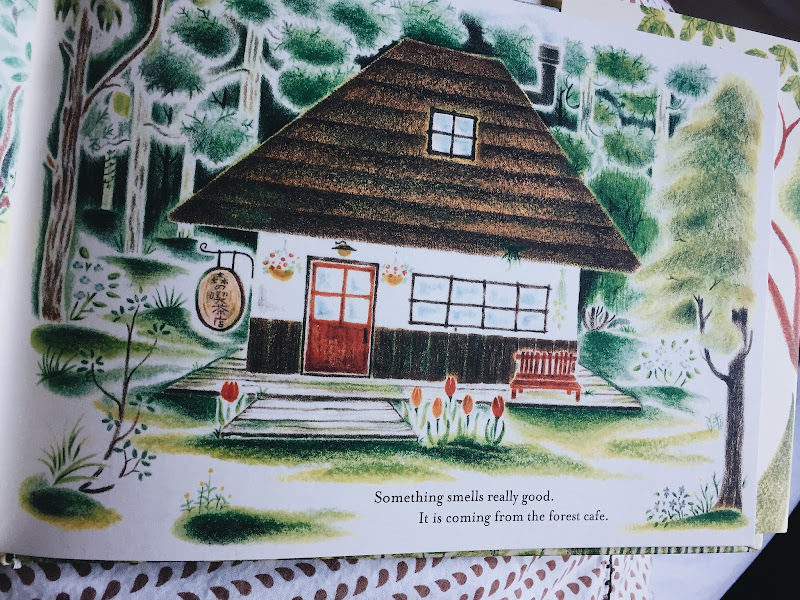 A couple years ago, I bought a copy of Springtime in Noisy Village by Astrid Lindgren in Swedish just because it was much cheaper on eBay than the English versions. I contemplated learning Swedish. Actually, it was in my search for an English version that I stumbled across your blog for the first time. Serendipity! So buy the Japanese version! I am sure it will lead to great things. whoa that's way cool. swedish seems like such a hard language! i totally don't care if it's in japanese, i think i gotta have that little kitty book! This does look darling! 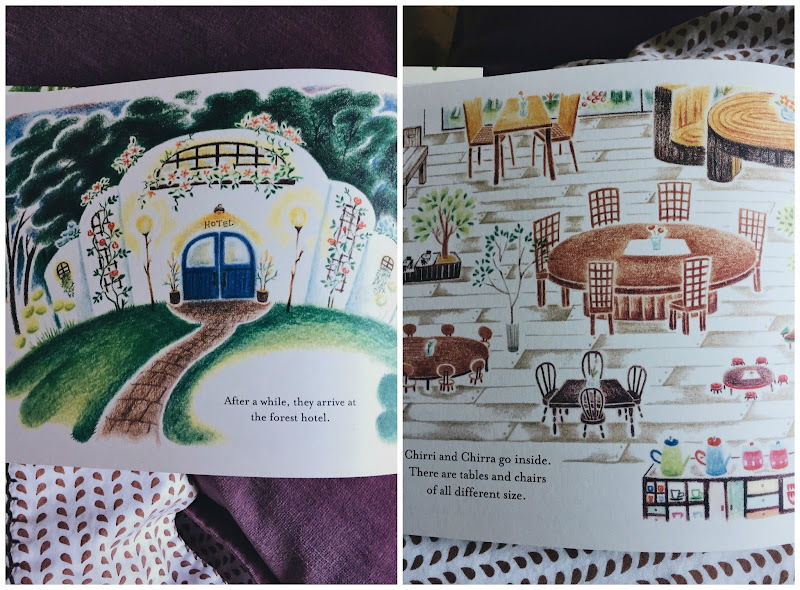 The illustrations remind me of Lois Lenski's a bit. YES. that hazy smudgy dreamy vibe!!! I want to visit that forest! I am off to find this book. I love their names. oh sister me too. seriously, they had me at violet tea and that BAKERY. if I was 4 or 5 years old this would be my favorite book of ALL TIME. I had to follow up-I received this book-and it is beyond adorable. I am entranced by it, and as my daughter said "I want to move to those woods, right now!". OH YAY!!!!!! I'm so glad you love it!! !